Inspired by the four-string he used on GNR’s Appetite for Destruction. Fender has released the Duff McKagan Deluxe Precision Bass, a four-string inspired by the 80s-era Jazz Bass Special he used on Guns N’ Roses’ Appetite for Destruction. 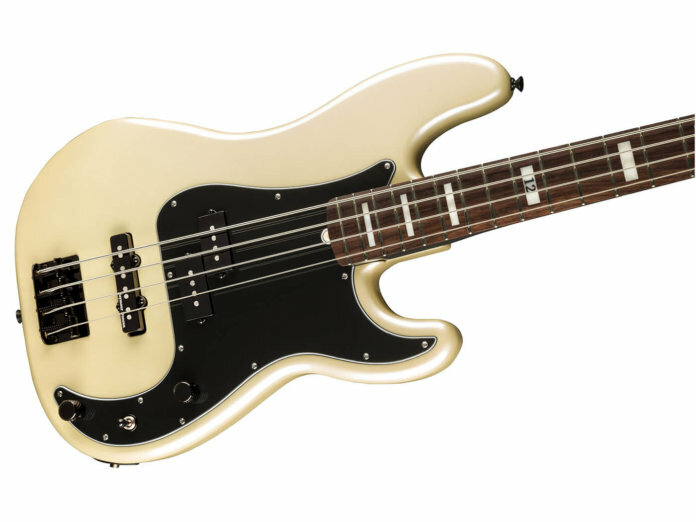 The new instrument also builds on McKagan’s earlier Fender signature model. It features a similar tonewood configuration: alder P-Bass body, maple Jazz Bass neck and rosewood fingerboard. It does, however, feature block pearloid inlays instead of the dots on the earlier model. A handy feature that has been added to this P-Bass is the Hipshot Bass Xtender, which instantly drop-tunes the instrument’s E string at the flip of a lever. The electronics on this bass don’t stray far from the previous signature model. It has a split-coil P-Bass pup in the middle, and a Seymour Duncan STKJ2B Jazz Bass single-coil in the bridge position. The three-way toggle switch and Treble/Bass Expander (TBX) tone circuit have also been retained. Instead of two volume knobs, however, the new signature model features a master volume control. Available in White Pearl and Black finishes. Retails at $1,199. More info at fender.com.